Many think sports nutrition is all about taking plenty of proteins, water and supplements. It couldn't be farther from the truth. Good nutrition is the lifeline for sports persons and can be means to winning a goal. Eating the right food at the right time can help the sportsperson train well, recover fast, maintain health and perform to his best. The calorie requirements vary from sport to sport and from person to person in each sport. While speed or power events need about 6000 calories per day, team games require approximately 4500 calories per day. Moderate proteins with sufficient carbohydrates will ensure energy and muscle strength. The protein requirement varies from 1.2 grams to two grams per kg body weight and should be about 15 to 20 percent of the total energy intake. Breakfast is vital, and the need for salt (particularly sodium) increases with increased number of training hours. Though there is a higher requirement for some of the B vitamins, calcium and iron, these are easily met through a well-balanced diet. Greasy foods are no-no for sportspersons. Though total fat intake is increased in order to match the higher calorie requirement in sports, overeating of fried foods or high fat foods will change the body composition and hinder performance. Saturated fats should be restricted. High sugar foods are best used in small quantities. Supplements are no substitute for a health building, nutritious food in take. Salt requirements can be met through the diet and there's no need for salt tablets. Junk foods that are high fat and or high sugar are to be kept away completely. Alcohol can be dehydrating use judiciously if needed but definitely not before, during or after an event. 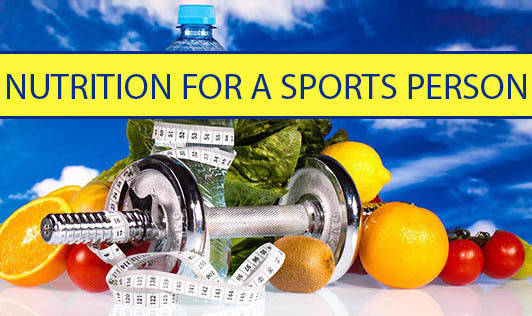 A qualified nutritionist or dietitian will be able to guide sportspersons on how to obtain their nutritional requirements. Ultimately, maintenance of a healthy body by adjusting food intake and physical activity according to the individual needs is the key factor for good sport activities.